We love client referrals. When leadership at Shadow Mountain Church began their search for an effective, state-of-the-art method of linking their campuses via video, the consulted with other multi-site churches in Southern California to ask what method they used to integrate their own weekend message at remote campuses. It was through one of these neighbors that Shadow Mountain learned about Link Up Communications – a technology integration company that had the know-how to link up to their multi-site campuses scattered throughout the San Diego area. When it comes to understanding the elements of an effective broadcast, the staff at Shadow Mountain Church is particularly discerning. Well-known pastor, author and Christian broadcaster David Jeremiah is the teaching pastor at this notable church. In addition to their main campus, Shadow Mountain has three off-site campuses in Alpine, Encinitas and Grace North Park. In particular, Shadow Mountain was looking for system of transmission that would not only link these current campuses together, but was easily duplicated as further campuses are added in the future. 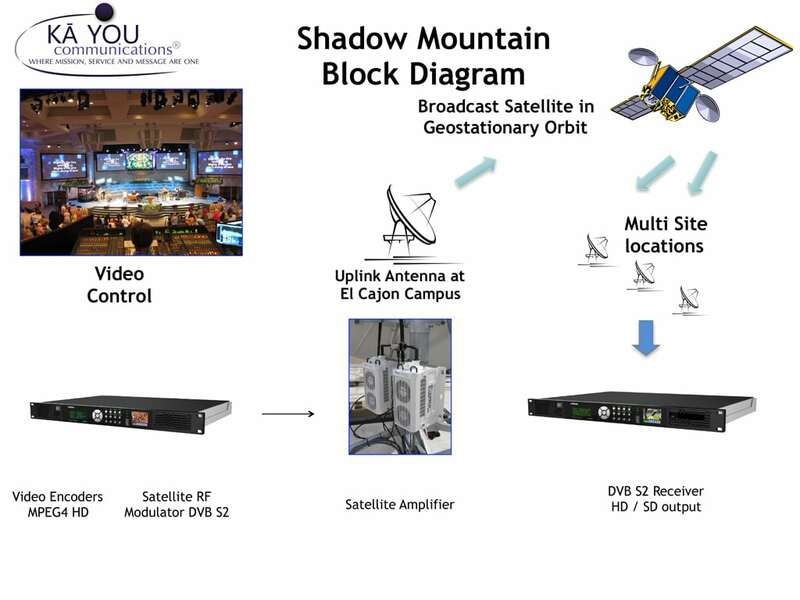 Why satellite? One major reason was the Alpine campus. It posed specific challenges because of its remote location and the many trees on the property. An IP solution would have cost the ministry precious time and money, and still would not have been as reliable as satellite. A non-penetrating mount 2.4 meter Ku-Band uplink antenna was installed on the roof of the main campus. The system is fully redundant, and includes two RF amplifiers and an RF switch, with high definition video encoders and satellite modems mounted in the church’s video control room for operators’ easy access. Receive-only satellite antennas were placed at the downlink sites. As with other Link Up installations such as Saddleback Church and North Coast Church, the Shadow Mountain staff was given training on how to operate the system and install downlinks at additional sites. The Link Up team continues to provide 24/7/365 customer service to ensure that its clients’ transmissions are smooth and uninterrupted.